Your Friday just got better with free green fees on WGT! 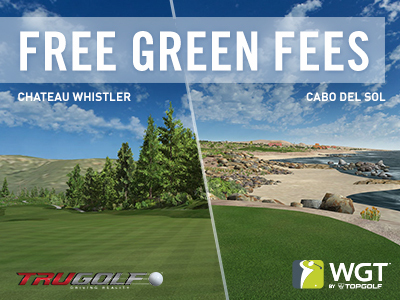 We're giving you the chance to play Cabo del Sol and Chateau Whistler on us, today only. So if you've ever wanted to try out these courses, today's the day to experience the challenges (and scenery!) they have to offer. *Special offer available to all wgt.com players, play virtual golf courses Cabo del Sol and Chateau Whistler, with no 18-hole stroke play green fees on 11/10/17. Note, these courses are not currently available on WGT Golf Mobile.